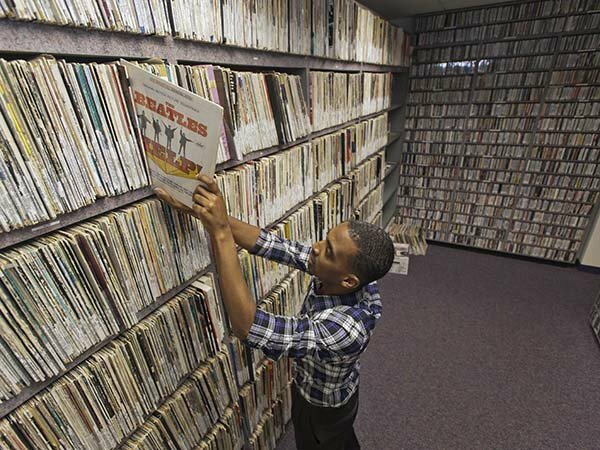 At WGLS-FM, my boomer heart delights at the sight of reel-to-reel tape recorders in the studio and vinyl records in the music library. "It's tough to part with this stuff," says Derek Jones, manager of the Rowan University radio station. Amid a sleek array of state-of-the-art digital equipment, "we have turntables in here, too," Jones adds. WGLS went on the air in January 1964, when I was in Western Massachusetts, mesmerized by the Top 40 crackling out of my transistor radio from WTRY-AM in Troy, N.Y.
What was then the Glassboro State College station signed on at 89.7 FM with a puny 10-watt signal and a format composed mostly of what was called "easy listening." WGLS programming has long since embraced rock and other genres of popular music, along with a variety of public-affairs programs and regular coverage of Rowan football, basketball, baseball, and other sports. The station's signal has been ramped up to reach 1.5 million potential listeners within 30 miles of the transmitter in Harrison Township. "Plus, you can hear us anywhere in the world online," says Jones, 35, who grew up in Somerdale, graduated from Rowan in 1998, and lives in Glassboro. Even in conversation, his voice - like those of other members of the mostly volunteer staff - has a distinctive, resonant, engaging texture. "This is how I talk," says Matt McCourt, who holds the enviable title of rock director at WGLS. "I'm not putting on my radio voice." McCourt, 21, of Quinton, Salem County, hosts a show called Bonus Stage from 9 to 11 p.m. Tuesdays. He plays music he wants his listeners to hear, as DJs did during FM's creative heyday 40 years ago. For much of the broadcast day, WGLS uses a digital music-selection program called, appropriately, Selector. But evening shows are shaped by the tastes of actual human beings, not algorithms. "I'm trying to promote Jersey bands and get a local feeling going," says McCourt, who recently discovered a North Jersey outfit called the Sam Haiman Band. "We sent out maybe 100 press kits with the song," bandleader Sam Haiman says from Passaic County. "Matt was one of the [few] who responded. He has really helped our career." Between 60 and 80 Rowan students and interns work at WGLS during a typical year. The station has won 244 regional and national awards since 1993, and prides itself on its professionalism. "When I graduated, I was actually prepared to work at a real, live radio station," says WGLS alumna and '93 Rowan graduate Angela Mason, an on-air personality, assistant music director, and assistant production director at Philly's WOGL-FM. "I'm very proud of where I came from." Says Erica Ortiz, a Class of '99 member who helped launch a weekly Latin music hour in the mid-1990s, "it was great, hands-on experience that enabled me to learn the medium" of broadcasting. "We had to get in there and do it ourselves, not just look over someone's shoulder," adds Ortiz, who grew up in Atlantic County and now lives in Washington. "We had a real, live audience. We took it very seriously." Mason and Ortiz were among about 200 WGLS alums at the station's 50th anniversary bash Saturday. Longtime general manager Frank Hogan, who retired in 2012, was there, as well. A veteran of WFIL-AM, he's credited with helping WGLS build its reputation. "The larger companies have made radio into an iPod. What's lacking is personality," says Hogan, 64, adding that he got bitten by the radio bug as "a mixed-up teenager growing up in Philly" in the '60s. "A colleague of mine used to say, 'You've got to love this business, because you're not doing it for the money,' " he recalls. "And he was right." The kids I talk to during my station visit share Hogan's romance with the medium. "When I'm in there, playing the music," McCourt says, "it's one of the best feelings in the world."